Our teriyaki sauce also contains a range of fresh flavourings, including ginger and garlic. 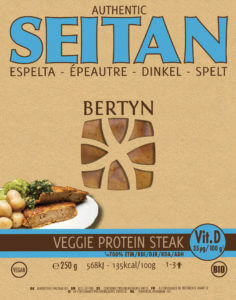 The combination means that the seitan, which is made of organic wholemeal spelt, goes perfectly with noodles and rice. It’s a true oriental addition to any meal, together with the pure and flavoursome teriyaki sauce. Don’t forget to take a look at our recipes with Teriyaki Protein Tops. Teriyaki Protein Tops find your fresh in the cooler of your health food store. Een verpakking Teriyaki Protein Tops bevat 200 gram. Donker en koel bewaren bij maximaal 7° C. Tenminste houdbaar tot: zie voorkant verpakking.